Does Calories-In and Calories-Out work on Keto? In the last 162 days I have averaged 2391 calories a day. My weight is the same at the end of these 162 days. My total energy expenditure (TDEE) is calculated at 2232 calories a day. This is only 159 calories a day from my TDEE or 7% off the calculated amount and that’s less than half the assumed measurement error in the food (typically assumed to be 15%). So, yes, I conclude that Calories-In and Calories-Out do fairly closely match. At least in my particular case and macros. Where Keto comes in is that I have maintained a 120 lb loss for the past 5+ months without hunger. My hormones are in balance. My insulin level is kept low. I don’t have the blood sugar roller coaster ride. Here’s a good podcast covering this subject (Sigma Nutrition Radio #85: What Drives Fat Gain? – Thoughts on CICO, Insulin & Obesity). Eat less – Move More? Are we fat because we have become sedentary? Study of the Hadza (Pontzer H, Raichlen DA, Wood BM, Mabulla AZP, Racette SB, et al. (2012) Hunter-Gatherer Energetics and Human Obesity. PLOS ONE 7(7): e40503.). …average daily energy expenditure of traditional Hadza foragers was no different than that of Westerners after controlling for body size. The metabolic cost of walking (kcal kg−1 m−1) and resting (kcal kg−1 s−1) were also similar among Hadza and Western groups. The similarity in metabolic rates across a broad range of cultures challenges current models of obesity suggesting that Western lifestyles lead to decreased energy expenditure. We hypothesize that human daily energy expenditure may be an evolved physiological trait largely independent of cultural differences. Pontzer H, Raichlen DA, Wood BM, Mabulla AZP, Racette SB, Marlowe FW. 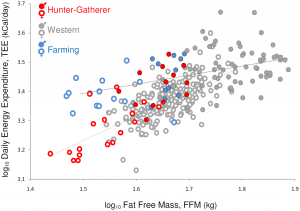 Hunter-Gatherer Energetics and Human Obesity. Chehab FF, ed. PLoS ONE. 2012;7(7):e40503. Jimmy had Keto Savage, Robert Sikes, on his podcast (19: The 90 Percent Fat Hack Protocol With Robert Sikes). Jimmy called him a nutritional expert (@4:20, 4:50). I have nothing against being self-taught on nutrition – that’s what I am. But I don’t think that Keto Savage is a nutritional expert. He is a body builder who does Keto. The thing I like best about Robert is that he publishes what he eats and his results even if they contradict the keto narrative. He doesn’t cherry pick through the data. One thing that Jimmy could learn from Keto Savage is Robert’s own 4,000 calorie fat challenge. Robert went on a 2 month diet with low carbs and high fat and took his body fat from around 4% to 10%. If you are not used to looking at body fat numbers he went from very low to less low. I wrote about Robert’s test (Does Fat Make You Fat?). To Robert’s credit he tried to do his best with Jimmy’s request since he viewed Jimmy’s calorie choices as too low on the low fat diet. We have moved our Low Carb Studies Athlete materials to a new BLOG – The Low Carb Studies Athletics BLOG Site. If you are interested in Low Carb athletics be sure to bookmark this new site. This will give us the chance to concentrate on Low Carb diets on this site. 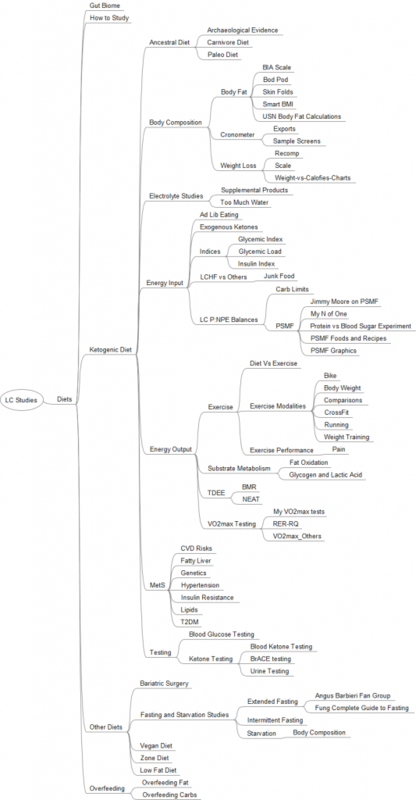 I’ve been collecting studies for a while and hosting them on GitHub at OpenKeto/KetoStuff. Here’s the structure of the studies. Some of the studies can be put into multiple places so I picked one or the other place to put them without much pattern as to why. Classifying the LC Diet as Energy Input is possibly the key insight into this pattern. Also, the Effect of the Ketogenic Diet on Diabetes is under MetS. With GitHub Desktop you can replicate the entire repository onto your computer or select individual files to download. Copyrights are the individual holders. Studies are reproduced here and were found on the Internet in general. An interesting study (J O Hill J C Peters G W Reed D G Schlundt T Sharp H L Greene. Nutrient balance in humans: effects of diet composition. The American Journal of Clinical Nutrition, Volume 54, Issue 1, 1 July 1991, Pages 10–17). The purpose of this study was to examine the effect of alterations in diet composition on energy expenditure and nutrient balance in humans. Eight adults (three men, five women) ate a high-carbohydrate (60% of calories from carbohydrate) and a high-fat (60% of calories from fat) diet for 7 d each according to a randomized, crossover design. Six subjects were studied for an additional week on a mixed diet (45% of calories from fat). For each subject, total caloric intake was identical on all diets and was intended to provide the subject’s maintenance energy requirements. All subjects spent days 3 and 7 of each week in a whole-room indirect calorimeter. Diet composition did not affect total daily energy expenditure but did affect daily nutrient oxidation by rapidly shifting substrate oxidation to more closely reflect the composition of the diet. You can burn more fat and not lower your metabolism on a lower carb diet. Select the timeframe you want to look at. You can export all data if you want. 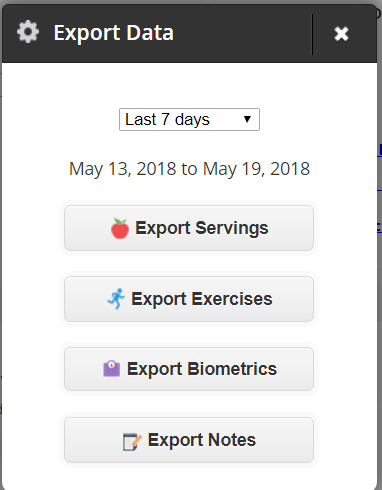 You can then export the servings, exercises, biometrics (weight if you have a linked device) or things you have entered, and any notes. The output file is a CSV which can be opened by any spreadsheet program. I listen to quite a few Keto Podcasts. They can be informative and in some cases entertaining. Here’s some of them. The Paleo Solution Podcast – It might seem like an odd first choice but I really like Robb Wolf’s style. He’s one smart paleo cookie. He has quite a bit of keto content and has done keto for much of his adult life. 2 Keto Dudes – There’s a lot to like with these two software developers turned keto dudes. They’ve had a similar journey to mine with overcoming Type 2 Diabetes and their interview format is flexible enough for them to have guests that aren’t exactly in line with their higher-fat views. I’d like to see these guys get closer to goal weight but their reluctance to do Protein Sparing Modified Fasts (PSMF) is really slowing down their progress. Keto for Normies – Her voice can be grating and his can sound like a meathead but their hearts are in the right place. They aren’t afraid to try things like PSMF or Carnivore and report on their successes or failures. The Primal Blueprint Podcast is hosted by Mark Sisson, author of a famous low-carb paleo blog Mark’s Daily Apple. Ben Greenfield Fitness – Ben Greenfield is another really sharp guy with some good insights into keto and athletic performance. Keto Savage – This is the guy who ate 4000 calories a day and gained body fat. Keto Geek – A good science keto show. Ketodontist – An orthodontist/dentist who lives keto and has some great interviews as well. Keto Talk with Jimmy Moore – It is with great reluctance that I list this podcast. Mostly I am listing it because Jimmy Moore tends to have some pretty good guests. But Jimmy’s dramatics are a bit to take at times. The same sets of guest often make the rounds on each of these shows. They all seem to have the same list of keto guests such as Dave Feldman (Cholesterol Code), Marty Kendall (Optimising Nutrition), Shawn Baker (Carnivore Diet), Ted Naiman (Burn Sugar Not Fat), Robert Sikes (Keto Savage), Luis Villasenor/Tyler Cartwright (KetoGains). It does also entertain me that the podcasters often interview other podcasters. I haven’t deliberately omitted any podcasts that I know of. There’s some I have not listened to yet so if I find a new one, I will add it to this list. There’s a belief in the Low Carb community that fat doesn’t make you fat. And to some extent there’s some truth in that. 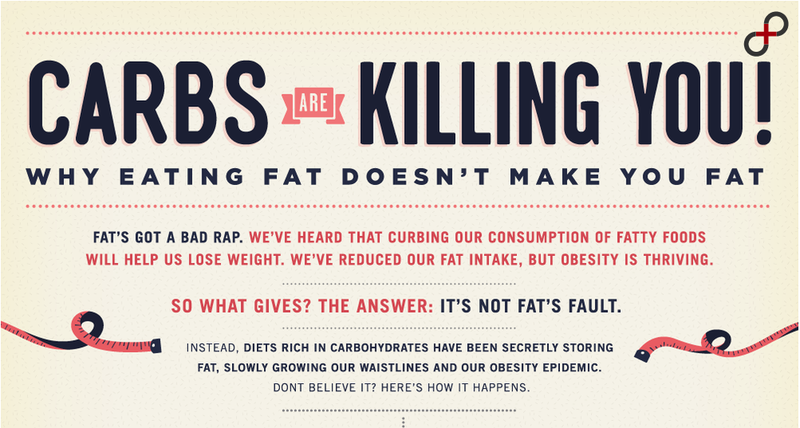 Most people are fat not because of the fat in their diet but because of the carbs in their diet. Here’s a typical infographic used by the Low Carb community which illustrates the point. Some people, myself included, have done experiments where we ate thousands of calories of fat for days or weeks and have seen little to no weight gain. However, there’s often not much data on the diet selected or timing windows. Did these people eat in a time restricted window? 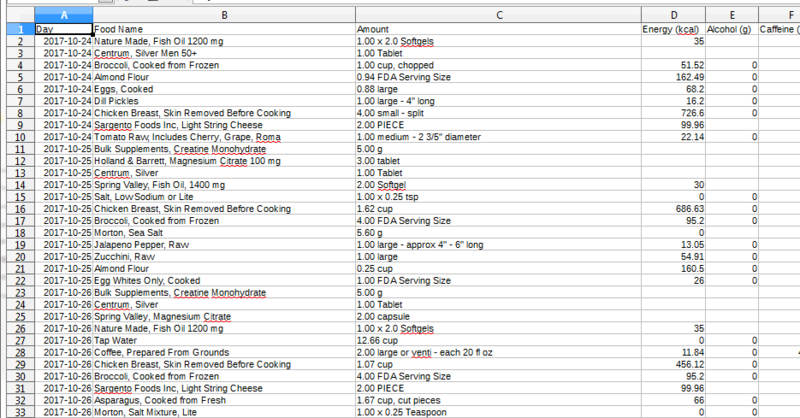 Keto Savage did a two month challenge where he ate 4,000 calories of the keto diet. That was 350g of fat a day. He went from 4.3% body fat to 10.1% body fat in those two months. He best part is that he logged his food and made videos as he went along. It is important to note that he did this “experiment” after he was on a weight cut for a bodybuilding show so he would have been at a reduced body fat level to begin with. So, yes. Fat can make you fat – even on a Low Carb diet. It takes a lot of work, but it can. Author DougPosted on May 17, 2018 May 17, 2018 Categories Exercise, Low Carb Diet, Recomposition1 Comment on Does Fat Make You Fat?